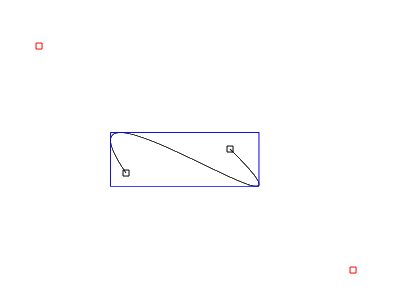 Goal: Showing an algo that computes the Bounding box of a cubic bezier. Audience: Needs some basic Math, Derivative, solving parabola, knowledge of computer language. Sample in c# : coming soon, at bottom of article. This is also my first usage of a HTML5 element, so IE users sorry! If you are NOT familiar with what a cubic bezier is, please look at this wiki page. If you use the start and end point of a cubic bezier and both of the controlpoints, you will end up with a box. This box will contain the bezier, but it’s not really tight. You want a tight bb (bounding box). The controlpoints of the bezier may lay outside the bb. }//this code snippet has been cut-n-pasted from project, may contain some err..
A possible way to compute bb is to add each point to bb evaluation, and you need plenty to ensure the exactness of the bb! Don't do this! Unless you want to do TDD and test if the bb is nearly the same as the bb you are about to compute for testing purposes. The exact solution can be found by using math. if you derivative the bezier function you can find local extremes. Do not forget the values of a,b and c! as defined above. If you find the where f(t)'=0 then you'll find local extremes. To do this you'll need to find where the parabola equals 0 for each of the axises. You'll need to solve the parabola (f(t)' is now a parabola!) for the x and y values of your points. To find out if there is a solution we'll use the discriminant (Quadratic formula) b^2-4ac. This will tell you if there is a solution. you can calculate the solution with (-b + sqrt(b^2 - 4ac)) / 2a and (-b - sqrt(b^2 - 4ac)) / 2a.
! !You'll need to throw away the first solution of 1.03163, since the bezier function is only defined between 0 and 1! us the solutions you came up as params for the original bezier function. ok,.. now you have the local extremes! And evaluation of the bb is next. Take the start and end point, include the local extremes. find the largest x and y value. there you have your bb! Now there is a small trap,..
your p0..p3 can be placed in such a way that for the f(t)' a becomes 0. When this happens the function is no longer a parabola, but a line. that is all you'll need to solve the bb of a bezier! _BBox.Add(p1); //Add Begin and end point not the control points! foreach (var e in _BBox) //find the bounding box. Out of curiosity, did you consider using the convex hull property? That is, the bounding box of the control points is also the bounding box of the curve (and I believe that holds for a Bézier curve of any degree), and doesn’t require solving the equation. The Control points are the two black and the two red squares (which you can drag around). It is true that the bezier is always contained in the box defined by the control points, but the bounding box (tightens possible axis aligned rectangle that encloses the whole shape) is defined by the curves bending points and begin and end-point. Didn´t you forgett a 2 ?